Living Democracy in Romania: From Protest to Referendum? In the wake of the so called “Second Black Tuesday”1), several independent authorities also took a stand against the governmental action. The Superior Council of Magistracy addressed the Constitutional Court with a request to solve a ‘legal constitutional conflict’ between the Government and the Parliament, stating that only the Parliament should have been allowed to pass legislation in the sensitive field of corruption as reflected in criminal offences. A similar request was made by the President of Romania, Klaus Iohannis. The Prosecutor General challenged the ordinance before the administrative courts, seeking its suspension. Finally, the Ombudsman, after having declared, on 1 February, that he will not challenge the ordinance before the Constitutional Court, decided a few days later to address the Court with an unconstitutionality referral.2) Meanwhile, following the popular uprising and criticisms international pressure – European Commission, several embassies of important democratic states (Germany, France and the US etc.) – the Grindeanu Government decided to repeal the Emergency Government Ordinance through another Emergency Ordinance on 5 February. However a hypothetical rejection by Parliament of the repealing act could bring into discussion the re-entry into force of the abrogated one, if Parliament decides to approve the latter – even if it does so tacitly. In the following days, the Constitutional Court gave its rulings on the above mentioned requests.3) On 8 February, it decided that there was no legal-constitutional conflict between the authorities because “the Government (had) exercised a power given by the Constitution”. There was no word about the lack of urgency or about the manner in which the ordinance had been passed. In this context, the present issue of the referendum on anti-corruption called by President Iohannis raises a few delicate questions. I will not discuss, at this stage, the purely political matter and its impact on the President and the political parties, but I will try to put it into a constitutional perspective. The initiation of this referendum looks like a legitimisation, from a constitutional viewpoint, of the popular uprising against corruption. 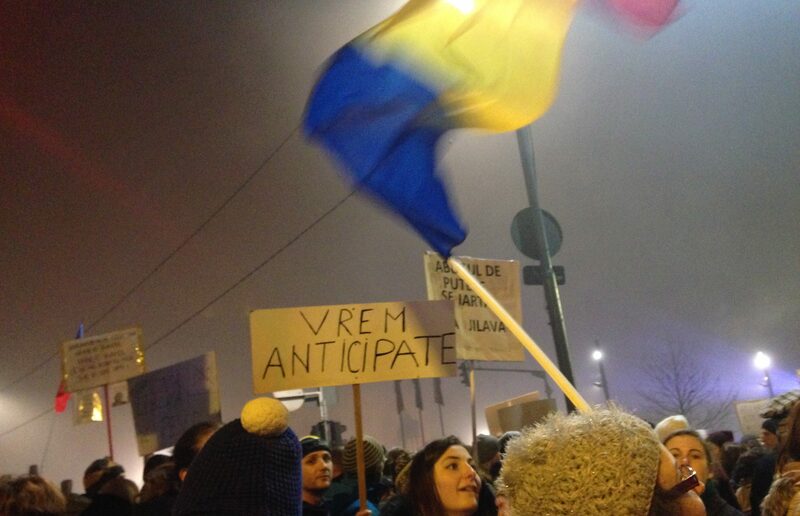 What happened in Romania since 20 January is almost unprecedented since 1989, as people did not have financial or social requests, but claimed respect for the rule of law – a founding constitutional principle of the still young Romanian democracy.5) Of course, one may question the necessity of this referendum in the current Romanian context. A country plagued by endemic corruption, with high-level officials from all main parties convicted or accused of corruption, with a low voting turn-out, with serious poverty and other social issues. A country where most governments chose to legislate by emergency ordinances, with the tacit approval of Parliament. A country which, although EU member state for 10 years, is under the supervision of the European Commission through the Cooperation and Verification Mechanism, precisely because of its corruption issues. It is difficult to say what a ‘negative’ outcome would mean. But it is also premature to claim that the Romanian people are not yet prepared to answer such a question, to which, at least apparently, all political parties agree on the positive side. Therefore, it will all depend on the actual question that will be object of the referendum. This question has not been made public yet, but right now it seems that all hopes for the actual respect of the rule of law in Romania depend on it. The first “Black Tuesday” took place in December 2013, when the Chamber of Deputies tried to change the Criminal Code so as to change the meaning of the offence of ‘conflict of interest’. The amendments were declared unconstitutional by the Constitutional Court. See, for details, Bianca Selejan-Gutan, The Constitution of Romania. A Contextual Analysis, Oxford, Hart Publishing, 2016, p. 86. The Ombudsman is the only authority that can challenge an ordinance directly before the Constitutional Court, other subjects can only challenge ordinances via the ordinary courts. The Decisions are still unpublished, therefore the motivation is not yet known to the public. As soon as the decisions are published, I will make more elaborate comments on the Court’s reasonings. SUGGESTED CITATION Selejan Gutan, Bianca: Living Democracy in Romania: From Protest to Referendum?, VerfBlog,2017/2/15, http://verfassungsblog.de/living-democracy-in-romania-from-protest-to-referendum/.